Veðurstofan hefur sent frá sér fárviðrisspá fyrir morgundaginn og hvetjum við alla að taka þá spá alvarlega og fylgjast vel með veðri og færð www.vedur.is og www.vegagerdin.is. Langt suður í hafi er nú lægð í myndun. Hún dýpkar með eindæmum hratt í nótt og er þrýstingi í miðju hennar spáð 944 mb seint annað kvöld og á hún þá að vera stödd suður af Reykjanesi. Á þeirri stundu verður 1020 mb hæðarhryggur skammt N af Scoresbysundi á austurströnd Grænlands og heldur hann á móti lægðinni. Saman valda þessi tvö veðrakerfi vindstyrk af styrk ofsaveðurs eða fárviðris yfir Íslandi. Hvessir á morgun og dregur úr frosti, fyrst sunnantil. Austan 20-25 og snjókoma sunnanlands eftir hádegi. Víða ofsaveður eða fárviðri á landinu um kvöldið, 25-35 m/s með slyddu eða snjókomu. Hiti um frostmark annað kvöld, en 0 til 5 stig sunnan heiða. Spáð er ofsaveðri eða fárviðri á landinu síðdegis á morgun og annað kvöld, fyrst S-lands. Fárviðrið skellur á sunnanvert landið eftir kl. 15 á morgun. Eftir kl. 19 má búast við ofsaveðri eða fárviðri um allt land. Með fylgir úrkoma og verður hún á formi snjókomu og því má búast við glórulausum byl. Búast má við miklu úrkomumagni um landið austanvert. Seint annað kvöld er útlit fyrir að það hlýni nægilega sunnantil á landinu til að úrkoma verði á formi slyddu eða rigningar. Rapidly increasing wind and decreasing frost, first in the southern part of Iceland. 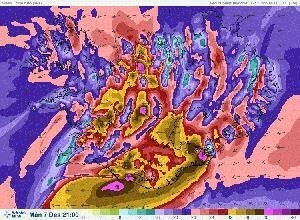 East 20-25 m/s and snow in the southern part tomorrow afternoon. Widely violent storm or hurricane-force winds (25-35 m/s) in the evening with sleet or snow. Temperature around freezing point tomorrow evening, but up to 5 deg. C. at the south coast. Violent storm or hurricane-force winds are expected throughout most of the country tomorrow afternoon and tomorrow evening. The magnitude of the approaching storm is so great that such conditions occur only every 10 to 20 years. Follow us onwww.facebook.com/almannavarnir and get updates from the Met Office, http://en.vedur.is/, the road authorities http://www.road.is/travel-info/road-conditions-and-weather/ and the Civil Protection an Emergency Management www.almannavarnir.is. Hurricane-force winds will develop in the south and south-east from 15:00 onwards on Monday. After 19:00 it is expected that the violent storm will affect the entire country. Significant snowfall will accompany the beginning of the storm, resulting in blowing snow and little to no visibility. By late tomorrow evening warmer conditions will affect the south and south-east of the country, where heavy sleet or rainfall will occur until early on Wednesday. According to the latest forecast, the oncoming violent storm will be far more severe than storms in recent days.